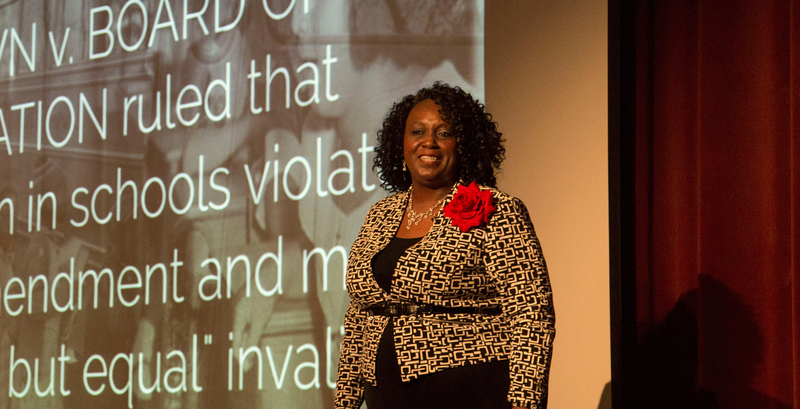 Cynthia “Mama J” Johnson, Ed.D., gives back to her alma mater, the University of Central Missouri (UCM), by speaking to education students about her experience overcoming poverty, stuttering and a learning disability thanks to help from caring teachers and her parents. A national leader in equitable education, Johnson also serves on the UCM College of Education Advisory Council. "Mama J" addressing the crowd at UCM's 2016 annual Freedom Scholarship Dinner in January 2016. In January, she came home to UCM as keynote speaker for the MLK Freedom Scholarship dinner, the highlight of the University’s annual Dr. Martin Luther King, Jr. celebration. The dinner raises money for the Freedom Scholarship, a four-year Alumni Foundation scholarship for students from populations historically under-represented in higher education. In addition to cash awards, recipients benefit from mentoring through the Office of Student Experience and Engagement. UCM President Dr. Charles Ambrose was so impressed with her speech that he invited her to be a regular guest speaker in education classes. Since then, Johnson has spoken to future teachers six times. Many UCM students have no direct experience with poverty. “Cynthia opens their eyes and inspires them,” Wright says. Elizabeth Williams begins her sophomore year at UCM this fall. A native of Blue Springs, Mo., she plans to teach elementary school in an urban district—perhaps Kansas City. She heard Johnson speak during her freshman year. 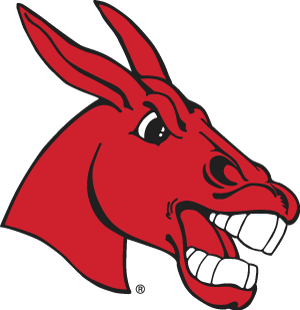 In addition to inspiring students, Johnson serves UCM on the College of Education Advisory Council. As a council member, she advises the dean on what she sees in the field and helps guide and shape the college’s practices. Growing up, Johnson’s home was a place of faith and love. It also was a place lacking what most consider necessities. When the family didn’t have the money to pay the water bill, they went to the park, filled a bucket from a spigot and took it home. They had the gas turned off every summer and used an electric burner for cooking and heating bath water. On top of poverty, Johnson struggled with stuttering and a learning disability. Johnson knew deep down she was smart, but succeeding in school eluded her. One gifted educator turned on the light for this future leader. Bell insisted. Mustering every ounce of confidence, she gave the speech and took home a first place trophy. She went on to compete in speech in high school and at UCM. Johnson blew away the competition in college, eventually earning the national Outstanding Collegiate Competitor award. Johnson was the first person inducted into UCM’s speech and debate honor society, the Podium of Honor. She says her Talking Mules experience prepared her for public speaking and teaching. She set her sights on becoming a high school speech teacher. Her dream came true when she was hired as speech and debate coach at Raytown South High School in Raytown, Mo. Johnson received both her bachelor’s and master’s degrees in education from UCM, then earned her doctorate in educational leadership at Baker University. After teaching 10 years, Johnson moved into administration. She was an assistant high school principal for two years and a middle school principal for 11 years. A crusader for change in urban education, she became a consultant for the National Middle School Association. Johnson releases two books this fall, Poverty, Diversity, Equity and Excellence, a book about closing the achievement gap between the poor and privileged, and From Poverty to Potential, which applies story to working with children in any setting. Johnson is an expert in equitable education. She frequently speaks at large professional development sessions kicking off a school year. Her presentations include singing, poetry, laughter and tears. She brings that same energy to her presentations at UCM. “It’s important for me to come back and give back and be a living example of what is possible when you have vision, when you have faith and when you get an education,” Johnson says. To learn more about Mama J, visit her website here!